The Wavestar machine is under rebuilding and will be extended with two more floats and updated with a new state of the art power take-off system (PTO). The machine is consequently out of operation and live data are temporarily unavailable. The wave height given is the so-called "significant wave height", scientifically represented as Hs. Hs is the average wave height (trough to crest) of the one-third highest waves. Hs is the most important parameter for characterization of the statistical distribution of ocean waves, and it is the parameter most often given in weather forecasts. The production from the Wave Star prototype depends strongly on Hs. At the Wave Star prototype Hs is calculated using wave measurements at the location. Two sensors are mounted to the prototype; an ultrasonic sensor above the water surface and a pressure sensor below the water surface are providing two independent estimates for Hs. Hs is given for the most recent 10 minutes of wave elevation. The wind speed and temperature is given as 10 minute average values measured 23 m above the water level (DVR90). The weather station is mounted on a pole 4 m above the top of the leg on the Wave Star prototype. 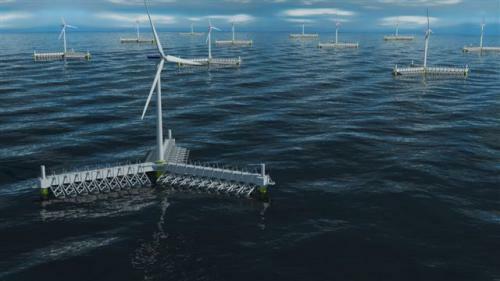 The prototype converts the power in the waves into electricity in the following way. The power in the waves is transferred into mechanical motion of the float and arm, and the power in this motion is absorbed via the hydraulic cylinders. The hydraulic cylinders are connected to an electrical generator which is delivering the electrical power to the grid. The power absorbed by the prototype is measured individually for the two floats using measurements in the hydraulic cylinders. The velocity and pressures in each of the hydraulic cylinders are measured continuously providing information about the hydraulic flow and pressure. The instantaneous power is calculated by multiplying the hydraulic flow and the pressure. The absorbed power is given as 10 minute average values of the instantaneous power leaving each cylinder. The absorbed power as function of the wave height is used to assess the performance of the prototype. Slides from a presention given at EWTEC, Southampton, 2011. The Wavestar machine draws energy from wave power with floats that rise and fall with the up and down motion of waves. The floats are attached by arms to a platform that stands on legs secured to the sea floor. The motion of the floats is transferred via hydraulics into the rotation of a generator, producing electricity. Waves run the length of the machine, lifting 20 floats in turn. Powering the motor and generator in this way enables continuous energy production and a smooth output. This is a radical new standard and a unique concept in wave energy; it’s one of the few ways to convert fluctuating wave power into the high-speed rotation necessary to generate electricity. Environmental and climate issues, as well as uncertainty about energy supply, demand that we diversify our energy supply to multiple renewable and clean sources. With enough space for wave energy machines but little exploitation thus far, Wavestar is not just developing a wave power device, but energizing a whole movement. Energy production with wave energy is more predictable than wind because waves come and go slowly and can be forecast 24 hours ahead. The Wavestar machine could also be installed together with a wind turbine which would further increase efficiency and reduce set-up costs. Wavestar understand that we need many renewable energy solutions, not just one, so it makes sense to harness the power of waves.